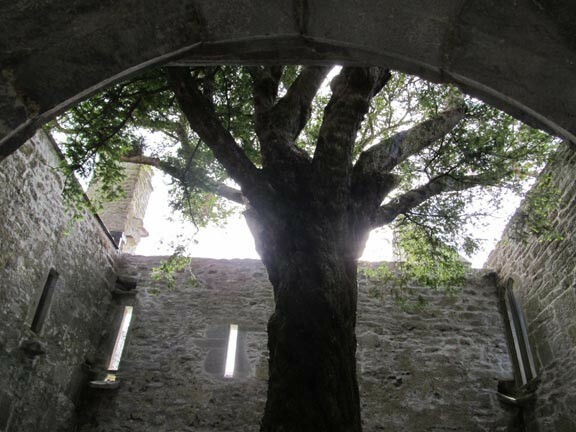 I took this photo in June 2012 in the ruins of Muckross Abbey, Killarney, Ireland. 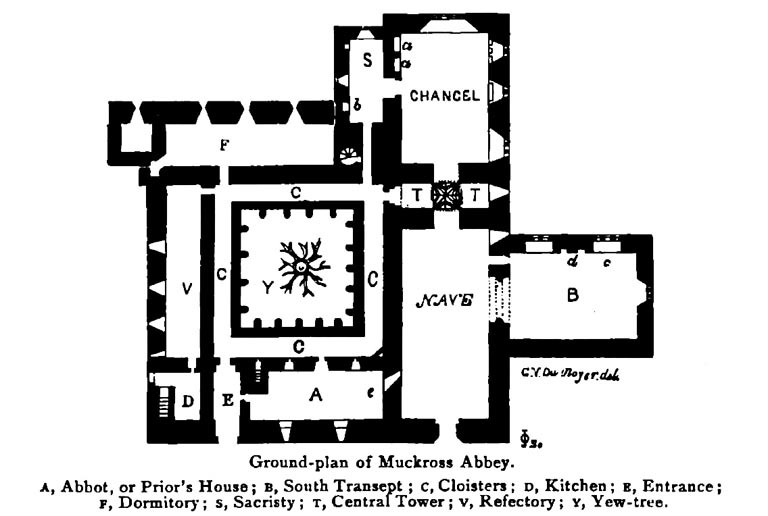 The tree, planted by Franciscan monks almost 600 years ago, is a common yew of the kind used for shrubbery in the U.S.
Reading & revising lessons from Cheryl Strayed’s memoir, Wild. Cheryl Strayed’s Wild, currently number one on The New York Times nonfiction bestseller list, is long and meaty, a traditional yarn; it feels both nakedly sincere and confident in its unguarded honesty, a book with a lot of heart. Just what I’m aiming for myself. But I couldn’t see how Strayed pulled everything off when I first read it in May, though I did see that she wove in her backstory instead of stopping the narrative with chunks and slabs of Vital Background. 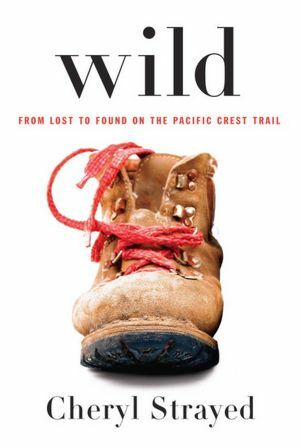 Wild depicts a grueling 1,100-mile solo hike Strayed took, in 1995, from southern California to Oregon, dodging bears and rattlesnakes and reading great literature in her tent at night, burning the pages in the morning in her campfire. She’d grown up outdoors but had never backpacked, not once, until she loaded her pack and tried to lift it just before setting out. She couldn’t pick it up, couldn’t budge it from the floor, having stuffed the large pack with so much that it probably weighed north of seventy pounds. She had to squirm into it on the floor and lift with her legs. And her boots were too small. That’s the strong foreground story, a young woman bent with a physical weight and carrying intolerable emotional baggage. Her backstory about that baggage includes memories of her abusive father, whom her mother divorced when Strayed was six; of being raised by her hippy-ish back-to-the-land horse-loving mother and a crunchy carpenter stepfather in Minnesota; of suffering through her mother’s illness and unexpectedly quick death from lung cancer at age forty-five, when Strayed was a senior in college; of being devastated by grief and by her subsequent affairs, heroin abuse, and divorce; of her picking that new last name, Strayed; of her impulse when at rock bottom to buy a book on hiking the Pacific Crest Trail, which she’d never heard of and which was thousands of miles to the west of her home in Minneapolis. Other than noticing that Strayed’s riveting life story was woven into the hike, what struck me the first time I read Wild was how Strayed depicted her affairs in comparison with a gritty essay about them she published in The Sun. At first I thought she wasn’t as graphic because she needed to be more likable for a 315-page book—her couplings went beyond rampant promiscuity into self destruction, considering the damaged and predatory men she picked to pummel her in the depth of her toxic sorrow. But now I’m sure, after reading Wild a second time, that her more elliptical treatment of her affairs was about a choice she made not to bog down the narrative. In the book, she only depicts one, with the man who started her using heroin and who was her and her long-suffering husband’s final straw. After that, Strayed, adulterer and neophyte heroin user, made an extreme and impulsive but life-affirming decision to take a hike to clean herself up. I got an abortion and learned how to make dehydrated tuna flakes and turkey jerky and took a refresher course on basic first aid and practiced using my water purifier in my kitchen sink. That’s it on the abortion, no depiction—because it wasn’t needed (and knowing that as a writer can be so hard; it can take hundreds of pages to see what should have been one line)—though Strayed does recall the abortion on the trail when she realizes one day that it would have been her mother’s fiftieth birthday and that she’d have had her baby about then. She knew she had to become a different woman first, she reflects, and not one trapped by children like her mother was. Strayed then spends much of the day painfully raging at her mother for dying. As a writer she’s unafraid to show herself in a bad light, and we get on her side, root for the straying orphan. Her plucky persona, that good-girl-gone-bad-trying-to-be good, really worked for me. I marveled at how fast I was devouring Wild—I’ve since heard others say they read it compulsively—even though the thought of donning a backpack made my spinus erectus muscles threaten to spasm, as if trying to protect my farming-ruined and thoroughly age-desiccated vertebrae. I might have been able to carry a pack when I was Strayed’s age when she did it, twenty-six and turning twenty-seven, but I doubt I would have endured the body chafing and pulped feet and six lost toenails that went with it. She was one tough chick. Next: Rereading Wild to unlock its intricate construction. Richard, I adore you and think you are so incredibly smart. This is the one time I disagree with you about a memoir. Thanks, Beth. I wish you’d say why! Or write about it on your own blog. I have drafted four posts on Wild, including this one, but the last one is about people who HATE Strayed and her book. Congratulations, by the way, on your own rave review in The New York Times Book Review last Sunday for your new novel. “Wild” is so different from her Dear Sugar columns at The Rumpus.net, but I now understand where she got her compassion and great common sense. Some of us have to live a hard life to learn how we want to live. I’m grateful to her for sharing her story, and for taking as long as she needed to write it. In my “third act” of life, it’s encouraging to read that good writing deserves however long it takes. Right now, I’m feeling defensive for Strayed (and myself?) for daring to put so much of herself on the page. I’m disturbed by the comparisons to Eat, Pray, Love, which apparently everybody hated (not me). EPL is not as beautifully written as Wild, but Liz Gilbert put her heart on the page, and it really bothers me when people criticize the author’s life choices instead of her writing. People do crazy, bad, “immoral” and unwise things. Sometimes they write beautiful books that shine a light on what it is to be a flawed human being who finds her way. I appreciate your thoughts, Linda. I think her backstory is mostly what sets off some people, and it took me a while to accept her self destruction after her mother’s death (more in my last post). But what an interesting nonfiction issue, the critical judgments regarding the memoir author vs. the pass we give authors of fiction for the flawed people who populate their books. I just found your blog. You put so much depth into blogging and I find myself moving from one post to another. I’m working on my memoir/creative nonfiction and find your blog helpful. Thanks so much, Peaches. How did you come across NARRATIVE? Great posts. Great picts. And thanks for yet another gotta-read-it. To me, Strayed is more storyteller than stylist, and a good one. But I do wonder, in nonfiction, do we really teach/understand story? Another wonderful post so helpful to those of us struggling with how to fold in voices and time into the story structure. Like Christine, I am an essayist and quake before the long arc. Looking forward to all these posts and to rereading Strayed with them in mind. Thanks for reading and commenting. Christin, this blog is ALL about teaching and understanding story, simply because I needed to learn it myself. My learning curve is pretty constantly transparent here. MFA programs do try to teach story in nonfiction, though I’ve ended up writing a memoir and am convinced that’s a whole other level than the narrative nonfiction I’d been groping toward as a journalist. I had to learn again all kinds of things about writing, everything really, plus how to build and structure a story across 300 pages—it’s called the learning curve. Richard says: But what an interesting nonfiction issue, the critical judgments regarding the memoir author vs. the pass we give authors of fiction for the flawed people who populate their books. Indeed. I am often frustrated that reviewers of memoir so easily lose track of the literary merits of the book and digress into the author/narrator’s life and whether they have lived a “worthy” enough life or if they are writing about something someone else thinks should be kept private or whatever. (As you say, all things that are rarely discussed regarding fictional characters.) It’s something to ponder in terms of the way memoir is critiqued. Yes, Jan! Stay tuned for Part Four . . . Meantime, don’t you think most memoirists know they are going to get massacred, called names and get hated, for doing what memoirists must, reveal aspects of themselves? Excellent, RIchard. Thanks for the link. Love section 3. Having an early draft of my post about WILD out there is interesting—am responding to input there to improve what hasn’t yet appeared here . . .
Richard, I just saw your question here, as to why…. I never put anything negative out here, if I can help it. Which means I read SO many books that I never blog about. So maybe someday when we meet — I hope we meet! — we will talk. I will only say here that Strayed’s book is not true memoir, but my definition at least. It is autobiography. The nature of her epiphanies and structure seem to push it toward that category. Thank you for your words, btw. I’m about halfway through Wild right now and really enjoying it so far. This is surprising to me because I usually can’t get into a book if I don’t identify with the main character and I don’t identify with her at all. I’m looking forward to reading the rest of your posts on this book. Congrats on being Freshly Pressed!